We have observed International Yoga day on 21st June 2017 at St. Philomina English School, Vidyaranyapura involving the students of the school and teachers. 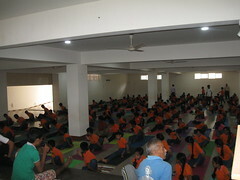 More than 250 students have participated in mass Yoga and Suryanamaskar program. The principal Sri Ravindra Kumar was the chief guest and he rendered all the help in conducting this program successfully. ​Sri Kumar Aniketh conducted the Yoga program involving all the 250 students for about 90 minutes assisted by Sri Mohan Lal, our Saha Nagar pramukh and Kumar Prithviraj, our Karyakartha. Our committee members Sri M.R.Gurumurthy, Sri Kodnad Satyanarayana, Sri Srinivasaiah, Sanchalak supervised the Yoga activity. The response from the students was highly encouraging. Guru Poornima was celebrated on 9-July-2017 at Yoga Kendra of Sri Puttashamaiah and Smt Ajantha Sudheendra. Sri Chidrupa Sharma, Veda Vidwan from Bengaluru was the chief guest and Sri Puttashamaiah presided over the function. The program started by lighting the lamp followed by invocation by Smt Usha Sridhar. Sri MR Gurumurthy welcomed the gathering and gave an introductory reference of the chief guest Sri Chidrupa Sharma. Guru Bhajan was conducted by Sri Srinivasaiah. Sri Srinivasaiah spoke about Kendra’s activities and briefed on the significance of “OM” which has been adopted by Our Kendra as ‘Guru’. Chief guest Sri Chidrupa Sharma spoke on the significance of Guru Poornima and explained the flow of knowledge from Vyasa and Guru-Shisya parampara. He gave an outline of Vyasa and Poornima and beginning of ‘Chaturmasya’ on Vyasa Poornima. He also said how our our “Poorvaacharyas” started Guru parampara. All the participants offered flowers to ‘OM’ followed by the ‘Prasadam’ distribution to the participants. There was an attendance of 35 people.